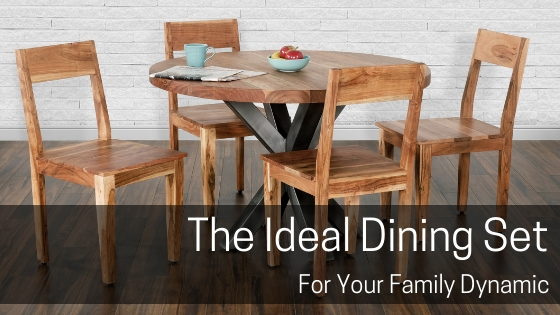 A dining set that fits your family dynamic is more important than you think. Evening dinner is a crucial time for any family that gels well. It gives children the opportunity to share in their day's activities. It serves as a stress reliever for hard-working parents after a long day’s work. It’s a place to laugh, love and break bread with the ones that mean the most. 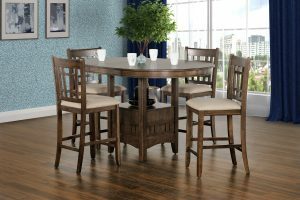 If you and your family have a dining set that matches your family structure, you can always look forward to a comfortable, stress-free evening with the ones you love. This set is ideal for those couples that just tied the knot. The foldable leaves make the table perfect for small spaces assuring an intimate setting for you and your new sweetie. Fold those leaves up for a full roundtable so you can entertain your favorite couple for a weekend home dinner double date! Planning to expand your family with some kids right off the bat? No problem! If you outgrow this set, it is very diverse and would look great in any room for afternoon tea, or a cozy wine and cheese spot for you and your significant other. You’re going to need the downtime after you get those kids to bed. The dining set pictured above would look great in a funky urban loft or condo. This is for those parents who have children but aren’t quite ready to give up the splendid city life. Its contemporary look with an industrial feel makes it a fresh look for a young family. You can dress it up with a nice carpet, or leave it in a bare room as the centerpiece for a minimalist design. 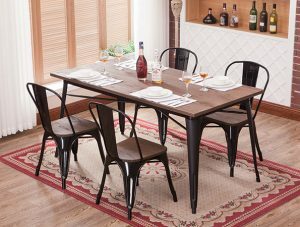 Style aside, the functionality of this dining set has a family of 3 – 4 in mind. 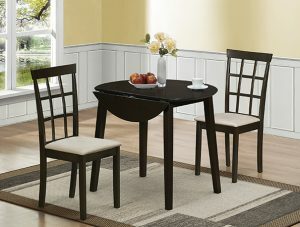 There is even a perfect spot at the head of the table for a height chair for your growing family. As you can see above, it’s a great spot for some evening cocktails and maybe even a board game as you host your favorite couple friends on a Friday night. Being a suburban parent with a maturing family can obviously be overwhelming. Often times you’re running kids all over town for school, sports, and play dates so having a home base for a family is a crucial concept. 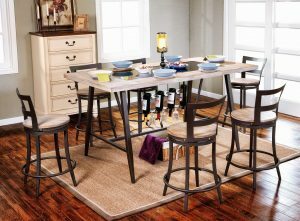 This dining set is at counter height so your kids will have a great spot for homework, arts, and crafts. A huge plus for the adults is; after a long crazy day as a suburban parent, with this table, the wine is always within reach. Your neighborhood friends are sure to love this feature! You did it! You got the kids through school and out on their own, and this dining set is for you. Obviously, it’s ideal for two to four people and has storage for your cutlery (or whatever else you want to store). I know you may be thinking; how are you going to have your entire extended family over for the holidays? See this table provides you with the perfect excuse! Now it’s up to your kids that have flown the coop to organize family holiday meals. It’s time to pass the torch. Besides your only concern should be where you’re traveling next and how best to spend your retired life. © Primo International. All rights reserved.